Fertility Matters is a national association promoting infertility awareness in Canada, based here in Moncton. 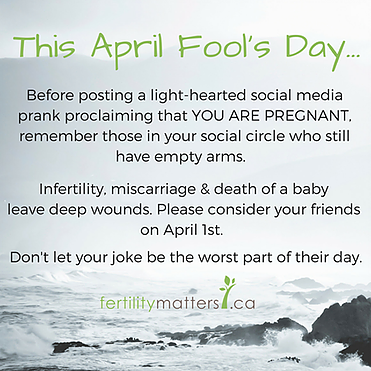 In advance of April Fool’s Day, the organization’s Facebook Page asked would-be pranksters to make fake pregnancy announcements off-limits. One in six Canadian families struggle with fertility. Think of how many couples you know; I bet it’s way more than six. Which means you know many people who are coping with fertility issues. Maybe they have kids now. Maybe they don’t. But either way, they likely won’t find a fake pregnancy announcement funny. If you are someone who has dealt with fertility challenges and would like to share your thoughts, Fertility Matters Canada wants to hear from you. The second annual #1in6 campaign is now accepting stories. These short glimpses into each others’ lives help raise awareness of the many aspects of the fertility journey.